Ramada Worldwide, one of the world’s leading international hotel chains with nearly 900 properties around the globe and a member of the Wyndham Hotel Group family of brands, today announced its continued expansion in the Middle East with the development of two new hotels: the 299-room Ramada® Plaza Kuwait City hotel in Kuwait and the 183-room Ramada Hotel and Suites Amman hotel in Jordan.The brand, which has grown by 80 percent in the Middle East and in North Africa over the past two years, now has nearly 40 properties throughout the region. 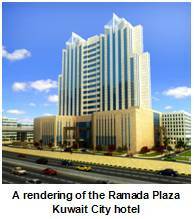 Located in Kuwait City and expected to open in October 2009, the five-star, Ramada Plaza Kuwait City hotel is being developed by Kuwait-based Gulf Real Estate Development House and will be managed by Abu Dhabi-based V. Five Continents Hospitality Group. The all new construction hotel will include four on-site restaurants, an executive lounge, a full service beauty salon and spa, outdoor swimming pool, gym, airport shuttle, valet parking, 24-hour room service, dry cleaning and laundry service, Internet café and hi-speed wired and wireless Internet access. It will also include a bi-level convention center with more than 2,950 square meters of meeting space. Located in Jordan’s capital of Amman just outside the city’s financial and business districts and expected to open in May 2009, the Ramada Hotel and Suites Amman property is being developed by Kuwait-based Taameer Real Estate Investment Company and will be managed by Mena Co. for Hotels. It will be the Ramada brand’s first hotel in Jordan. A 30-minute drive from Queen Alia International Airport, the four-star, upscale hotel will feature free high-speed wireless Internet access, laundry and valet service, car rental and driver services, full service hair salon, valet parking, concierge service, 24-hour room service, business center, fitness center, swimming pool and nearly 800 square meters of meeting space. The Ramada brand also recently opened its first hotels in six new countries, including Latvia, the Cayman Islands and Guam.